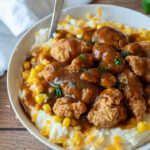 These Homestyle Chicken Mashed Potato Bowls are filled with fluffy mashed potatoes, crispy chicken and topped with a brown gravy! Cook the frozen popcorn chicken according to package directions, preferably in the oven or air fryer so they are nice and crispy. Meanwhile warm up the canned corn in a small pot over medium heat. Heat the Bob Evans Original Mashed Potatoes according to package instructions and divide into 4 bowls. Warm up the beef gravy according to package instructions as well. Top the hot mashed potatoes with ¼ cup of the shredded cheese, ⅓ cup of the corn kernels (drained), and a few strips of the crispy chicken strips. Drizzle the top of the bowl with the hot beef gravy and enjoy!